Silk Dupion 19mm 45" $16.25 15.16 $14.21/yd. Dupionni looks similar to silk Shantung but with more intentional slubs in the fiber. It has a crisp, firm hand with lots of linear texture and subtle luster. It dyes and paints brilliant colors but does not lend itself well to the use of gutta owing to the heavy, random slubs. The texture, weight and strength makes it wonderful for nicer pillow covers, wall hangings, jackets, pants, etc. 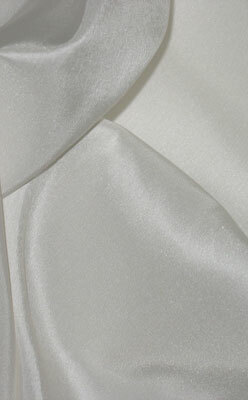 Silk Shantung is a kind Dupionni of silk that is woven in the Shantung Provence of China. I used this for my daughter's wedding gown. I died it to a beautiful shade of champagne. It photographed beautifully. The fabric had a beautiful subtle sheen. I backed it with dharma's silk organza. Beautiful of course but slightly lighter weight than the drapery weight available at the box stores which is more what I was expecting. Since this is lighter weight it doesn't seem to have as much slubbiness which is the great thing about dupion. Nevertheless lovely! This is not what you would expect dupioni to be. The fabric that I received was almost completely smooth. It did not have anything close to the texture that I associate with dupioni or even a shantung. I actually thought for a moment that I had been sent the wrong fabric until I found a slub in the fabric. Dupioni should have lots of slubs and texture. If like me that is what you are looking for then find it elsewhere. Have dyed cottons and cotton blends before but this was my first time dying silk. Was nervous...really nervous. How shocked was I when this came out absolutely stunning! I used the russet acid dye....ombre method. It went from a gorgeous red to a deep russet color....just perfect. I'll say it again...the color was stunning....and it was incredibly easy! Really happy!! Great fabric...although dupioni is always quite pricey anywhere you get it. What beautiful finely grained silk dupion! I love it and would certainly order it again if I needed silk dupion. This silk is perfect for my laser cut petal project. it feels so nice and it is strong. I first tea dyed it then it was laser cut into petal forms and then I added silk paint to the petals. It still looks beautiful after going through all those steps. Absolutely beautiful. Very smooth and lustrous. Perfect for anything from quilts to formal wear.